Investigators from the Main Investigative Department of the Ukrainian Prosecutor General's Office will soon summon Ukrainian President Petro Poroshenko for questioning in connection with the investigation into the crimes against Euromaidan activists in 2014, Ukrainian Prosecutor General Yuriy Lutsenko said on Ukrainian television's Channel 24 on Tuesday evening. "Yes, it [the questioning] was rescheduled. 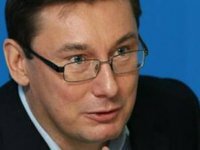 I think it will happen in the very near future," Lutsenko said, responding to a question as to when the president will be questioned as a witness in connection with the investigation into crimes against Euromaidan. Lutsenko did not specify when precisely the questioning will take place. "I will not announce the date," he said. According to earlier reports, Poroshenko, former Prime Minister Arseniy Yatsenyuk, incumbent Secretary of the National Security and Defense Council Oleksandr Turchynov, Kyiv Mayor Vitali Klitschko, Parliament Speaker Andriy Parubiy, and Zakarpattia Governor Hennadiy Moskal were summoned for questioning at the Ukrainian Prosecutor General's office as witnesses in connection with investigations into crimes committed against Euromaidan activists in January-February 2014.